We list the Apple TV software for Mac below to help you transfer any DVD movies and videos to Apple TV. Xilisoft YouTube Video Converter for Mac is a prominent Mac YouTube Video Converter for Mac users to download video from YouTube.com and convert the downloaded YouTube FLV, MP4, and Webm videos and almost all local videos on Mac to other video formats. Xilisoft YouTube HD Video Converter for Mac is capable of downloading and converting High Definition YouTube videos to a vast range of video formats on Mac, including AVI, MPEG, H.264/MPEG-4 AVC, MPG and etc in remarkable quality to fit to a bundle of multimedia devices iPod, iPhone(iPhone 4 supported now), iPad, Apple TV, PSP, Zune, 3GP mobile phone, Xbox. Xilisoft YouTube HD Video Downloader for Mac is a terrific YouTube video downloader which can speed up YouTube video playback and video downloading, and fast download YouTube High Definition videos in resolution of 720p or 1080p and standard definition videos to Mac easily. Xilisoft Download YouTube Video for Mac can download your favorite videos from YouTube for free. The free Mac YouTube video downloader can download HD YouTube videos, even 1080p and 4k videos to Mac, iPhone, iPad or other devices. Xilisoft YouTube to iPod Converter for Mac allows you to download and convert FLV and HD videos from YouTube.com to your iPod. The downloaded YouTube FLV video files are automatically converted for playback on your iPod touch, iPod nano. Xilisoft YouTube to PSP Converter for Mac helps you to download and convert YouTube videos to PSP/PS3 videos in order to play YouTube videos on PSP anytime and anywhere. Download all possible YouTube videos and convert them to PSP H.264 HD, MPEG-4(1080p, 720p, 480p), H.264 videos as well as PS3 DivX HD and DivX videos in one step simply. Xilisoft YouTube to iPad Converter for Mac is a professional iPad video Converter which helps you download and convert YouTube videos to iPad movies and music on Mac and watch them wherever and whenever you want. 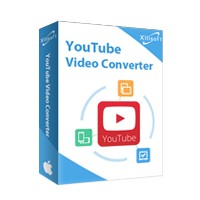 Xilisoft YouTube to iPad Converter for Mac helps you to download and convert YouTube videos to iPhone friendly formats in only one-step. Xilisoft YouTube to MP3 Converter for Mac is capable of downloading and converting audio tracks of YouTube FLV, MP4, Webm videos to MP3 format in only one-step. Xilisoft YouTube to iTunes Converter for Mac is perfect tool for Mac users to download and convert any YouTube videos to iTunes in one step. And then, you just need to sync these videos to your iPad, iPod or iPhone freely.